The new polysaccharide, discovered by Senior Research Scientist Dr Alan Little, and the team at the former ARC Centre of Excellence in Plant Cell Walls, located at the University’s Waite campus, has the potential to be exploited for many uses. “Plant cell walls contain components that are of major interest for many industries such as renewable sources for energy production, composite materials or food products,” says Dr Little. 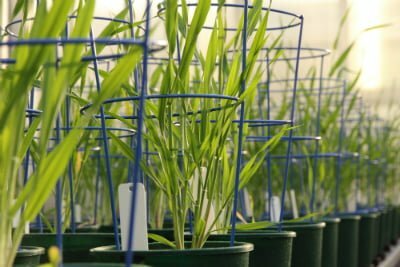 “We know that it can be found in the roots of barley suggesting it may play a role in plant growth or resistance to external stresses such as salinity or disease. “By observing natural variation of the polysaccharide in different cereal crops we will aim to identify links to important agricultural traits,” says Dr Little. Further research is required to understand the new polysaccharide’s potential uses. Existing polysaccharides have a wide range of uses. They improve the quality of dietary fibre in porridge and are also used extensively in biomedical and cosmetic applications. “The properties of the new polysaccharide could be manipulated to suit the desired function, increasing the range of potential uses,” says Dr Little. “The genes involved in the biosynthesis of the new polysaccharide were also discovered as part of this work. “The same genes can be found in all major cereal crops – not just barley.